What I basically want is to isolate specific virtual machines and let them communicate over their own VLAN in my network. So I setup VLan interfaces in my Linux box and tell VMware-Server to bridge to that interface.... and this gives an error. re-run vmware-config.pl to rebuild the kernel modules. The next thing you do in vmware-config.pl is defining for each VLAN you have a local vmnet. Now I recommend to not use the default vmnets (simply undefine them) and define your own instead.
. No virtual networks configured. 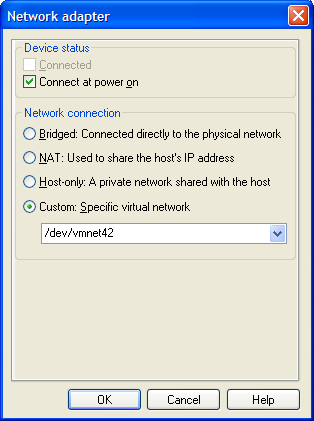 What type of virtual network do you wish to set vmnet42? Configuring a bridged network for vmnet42. Note that in the above example the mentioned vmnet42 will NOT be visible as an entry in the dropdown box of the GUI. You'll have to type in the actual value manually. VMware 2.0 BETA 2 complained about IPv6 being enabled. Because I do not (yet) plan to start using it I chose to disable it completely.